Happy Wednesday, friends! Yesterday was a not glamorous or fun day at our house. We had a new radon mitigation system installed in our new home. We had to wait around a few hours for the technician to come and install the system, but it’s in and done! Do you have high radon levels in your home? And do you have a radon mitigation system? Interestingly, years ago it was not something people talked or thought about. I certainly didn’t give it a second thought. Now with all of the inspections one must do in order to buy and sell a house, this has become a hot topic. Experts claim radon is the second leading cause of lung cancer after smoking. That’s serious! 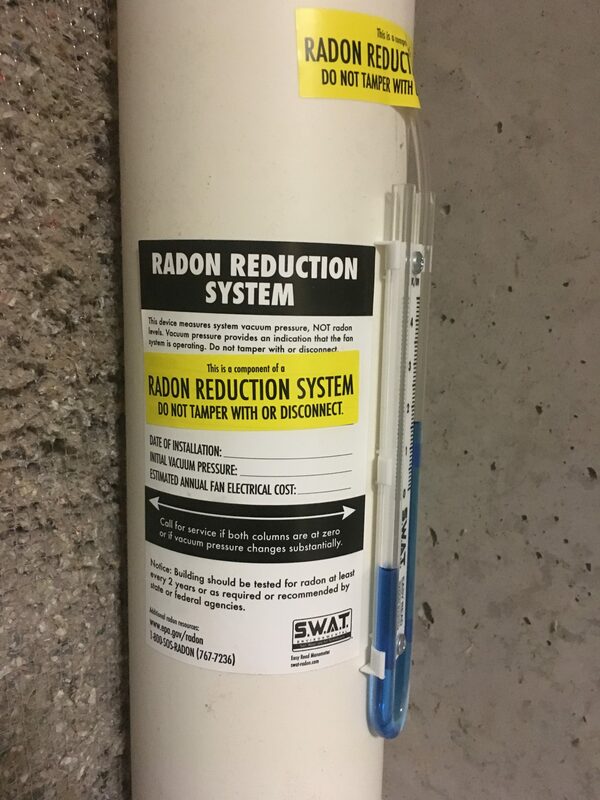 Radon mitigation is any process used to reduce radon gases through ventilation collected below a concrete slab and vented outside. When our last house was under contract, the inspector placed a radon detection kit in our basement for 48 hours. We had to keep the doors and windows closed during the test period and follow all other instructions to insure an accurate test. When the results came back, the reading was 4.5%. Any levels below 4% are acceptable. Thus, we had to install a remediation system prior to closing. We offered to give a $1000 allowance at closing for the buyers to install it at their convenience (to save me the hassle of waiting for the contractor, etc.) but they insisted we have it installed and tested before closing. So, we did. The cost was approximately $1,050. Then, when we purchased our new home in North Carolina, the radon levels were significantly higher. It was 20% (much more worrisome than 4.5%). Radon levels are apparently higher in basements and my husband’s office and our guest rooms are in the basement. Naturally we were concerned about our children and future grandchildren sleeping and playing down there. I wanted it fixed asap, even though it meant installing another mitigation system. I contacted a few mitigation companies in the area. One contractor was at least a month out and in addition to charging $1400, they wouldn’t guarantee radon reduction levels below 20% even after remediation. How is that helpful when levels should be at least below 4%? Next I contacted SWAT-Radon. (They are listed as one of the top 3 Radon Remediation Services in our area by HomeAdvisor.) They were able to give me a quote over the phone of $1, 045 for installation and equipment, plus a free radon test kit to retest in one week’s time. (The other company charges $125 for each kit.) And, SWAT came out the following week after I called, and installation took about 3 hours. The PVC pipe fits neatly in the corner of our basement unfinished area and vents outside in an inconspicuous corner of the house. You can’t see it from the road or the golf course, which was our hope. This is how the system looks on the exterior of the house. You can also have the PVC pipe painted to match the color of your house. The cost is an additional $129, which isn’t bad. However, it was raining yesterday and because the pipes are tucked in a corner of the house where no one sees, we didn’t bother. The technician had to drill a hole large enough to cut through the basement concrete slab and insert the pump. As an added precaution, my husband caulked the concrete floor seams where they meet the walls with a self-leveling, polyurethane caulk. Here’s how the pipe looks in the basement. I like the fact the interior and exterior pipes are tucked in a corner and hugs the wall. Very unobtrusive. A week after instillation, we will use the test kit they gave us and hopefully the radon levels will be within the acceptable range. My understanding is if the range is still not acceptable, then a stronger fan can be installed. I feel confident this will do the trick. Fingers crossed, all will be well! After all, we want our loved ones to be safe and sound in our house! Here’s Lacey Lou catching some rays on this chilly day, without a care in the world. She knows her Momma and Daddy will take good care of her, too. Do you have a radon mitigation system in your home? The technician said all homes should be tested every 2 years to make sure levels are acceptable. I admit when I first heard of radon, I thought it was over- blown. But why risk my family’s health? I feel better now we have our system in and we’ll all breathe easier (literally) when we have company or we are hanging out downstairs.